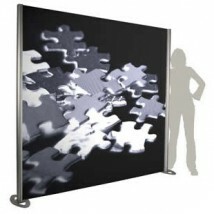 Modular exhibition display systems from Discount Displays. 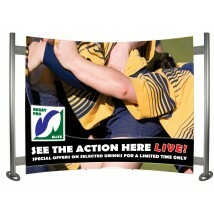 The most versatile modular exhibition stand system can’t be beaten for versatility. Our new linear modular exhibition stand system offers fantastic flexibility so you can increase or decrease the size of the exhibition stand or display to suit the occasion. Shown below are a number of popular modular exhibition stand designs available. Please call one of our display advisors and they will be happy to talk through the best solution for your requirements 0844 800 1020 and tell you more about our free design service. 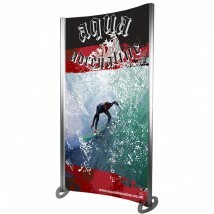 The Linear range is just a small part of our Portable modular exhibition stand systems offering. 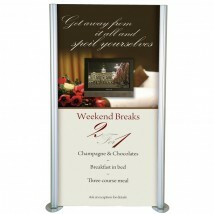 Our Linear portable modular exhibition stand systems is a great choice for point of sale marketing communications. 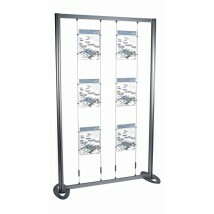 Constructed from durable aluminium the Linear system can be used as a permanent or semi-permanent display. This Linear exhibition stand kit is portable and easy to assemble and requires simple self-assembly with an Allen key that is provided. A good looking system that can use either rigid Foamex of flexible graphics Your graphics panels are magnetically attached in individual sections to the aluminium frame to create a seamless display. 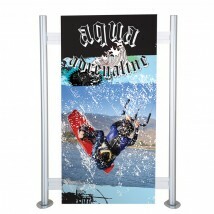 This Linear modular exhibition stand systems are portable, easy to assemble and require simple self-assembly.